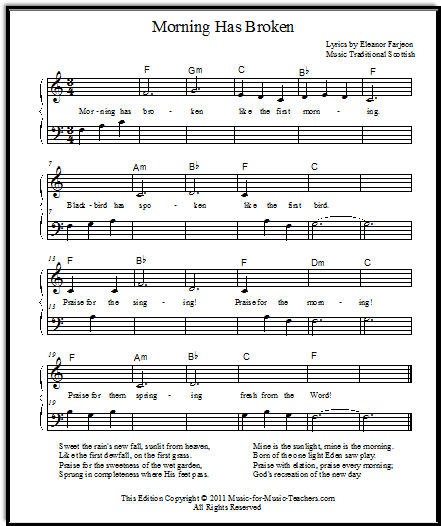 Free lead piano sheet "Morning Has Broken"! a couple of easy versions for beginners, with the melody shared between the two hands. Please scroll down the page for the links to the printable PDFs. 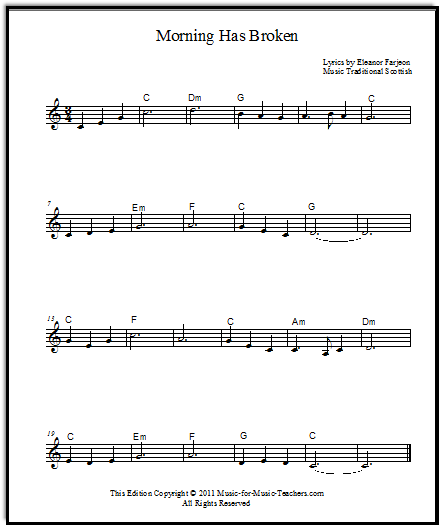 I like to use this kind of "note-reader" level song as a written homework assignment for my beginner students. Their job is to write in the names next to each note. A bonus with this kind of "homework assignment" is that they get to CHOOSE from several songs which one they want, and they usually end up PLAYING it, even if I have not asked them to do so! This beautiful old song with its lovely verses became a pop hit many years ago when Cat Stevens recorded it. 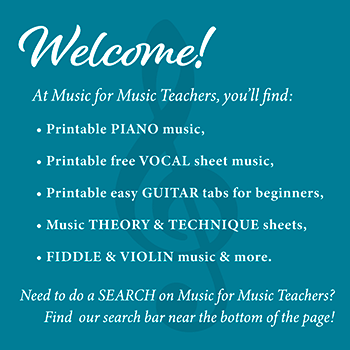 I have been giving my students lead sheets every few weeks, allowing them to choose what they like, and adding their own chord stylings to them. It's amazing what they like to play when given a choice! Morning Has Broken appeals to the kids who like "pretty" music, and who like to sing along as they play.